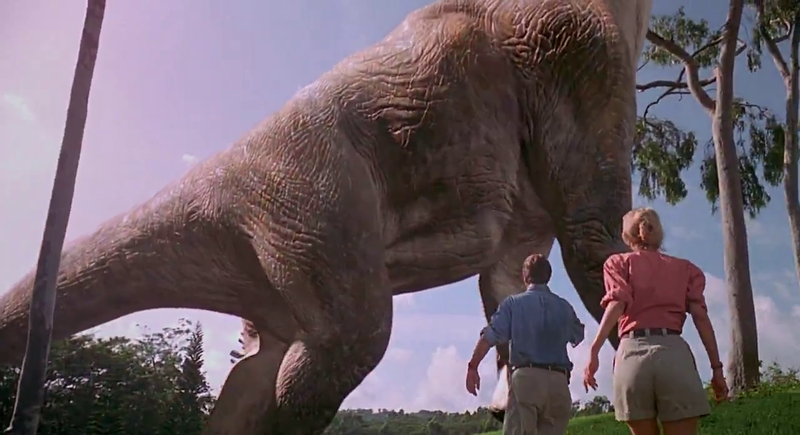 Venture Capitalist John Hammond hires paleontologist Dr. Alan Grant, paleobotanist Dr. Ellie Sattler, and chaos theoretician Dr. Ian Malcolm to visit and approve a novel safari park, named Jurassic Park, he has built on a small island near Costa Rica. He has populated the island with dinosaurs, which are cloned from dinosaur blood harvested from mosquitoes trapped in prehistoric amber. Joining the doctors on their remote-controlled Jeep tour of the park-in-progress are two of Hammond’s grandchildren, Tim and Lex, as well as lawyer Donald Gennaro. 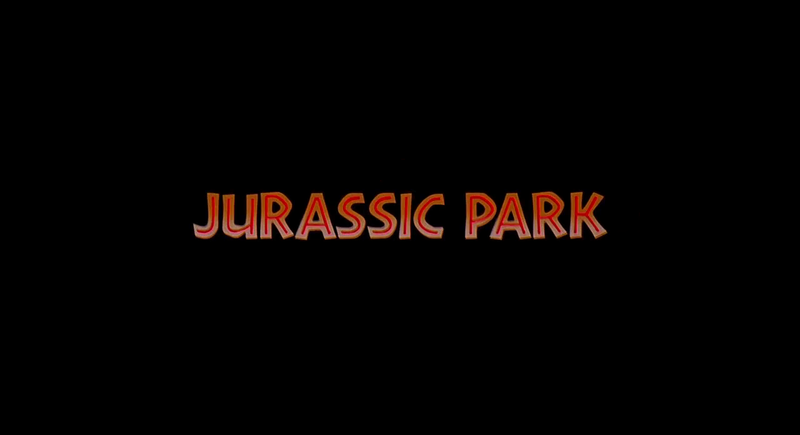 Though the tour is troubled with production problems, real trouble starts when a massive storm blows in just as the park’s key developer Dennis Nedry enacts a plan to steal dinosaur embryos—a plan which involves his shutting off the security system to hide his actions. To reboot the security systems, Hammond must shut off the power to the whole park. Without the threat of the electrified fences holding them in, the carnivorous dinosaurs break free and begin hunting everything on the island, including the people. Nedry, Gennaro, game warden Muldoon, and chief technology officer Arnold are each killed. Eventually the remaining survivors take refuge in the visitors center. They manage to restore power to the island and thereby the security system, but not before the vicious utahraptors velociraptors figure out how to *gulp* open doors, and flank everyone to the heart of the visitor’s center. All seems lost until the massive tyrannosaurus rex bursts in, hunting the velociraptors, and as the dinosaurs fight, the human survivors escape in a helicopter to the mainland. As with all overviews, ALL THE SPOILERS ahead. Some movies warrant just a few paragraphs, but it turns out this is a rather complicated plot. Oblivion opens 50 years after an alien invasion, during which a great many things happened. One team, Victoria and Jack, are two weeks away from retirement when they are awoken one night by a massive explosion. It is one of their hydro-rigs, sabotaged by Scavs in their section. While investigating the wreckage, they detect a strange radio signal. Jack traces it to its source, discovering a repeater in the ruined Empire State Building broadcasting a set of coordinates off-planet. Later he spies a vessel landing at the broadcast coordinates. He visits the crashed vessel to find it is part of a pre-war human spacecraft, the sleeping pod of the Odyssey. Within are hibernation chambers, but only one crewmember is alive. Jack recovers it as drones show up to destroy them. At the Tower, Jack and Victoria revive its occupant, Julia. The next morning Julia travels with Jack back to the crash site to fetch the flight recorder, but both are taken captive by Scavs. Through a remote-controlled bubbleship camera, Victoria observes them kissing and this drives her to betray Jack and Julie to the Tet. The Tet activates a Drone and sends it to kill them all, but it only kills Victoria before Julia destroys it. Traveling to another sector, Jack sees a clone of himself appear in a similar bubbleship, to service a Drone. They fight and the clone is killed, and Julia is wounded in the melee. Jack gets into the clone’s bubbleship and travels to its Tower, where he meets a Victoria clone, and he realizes that the planet must be populated by huge numbers of these clones. He fetches a medkit and returns to Julia. He takes her to recover in a log cabin in a lush valley he has been keeping secret from Victoria for a long time. After she heals, he returns to the Scavs, and helps them reprogram their captured Drone, but the Scav enclave is largely destroyed by other drones sent by the Tet. Back on Earth, Julia is awakes in a different hibernation chamber at the lush log cabin, as part of Jack’s duplicitous plan to save her. She gives birth to a daughter, and three years later is found by one of the Jack clones, accompanied by a group of the surviving Scavs. Posted in Oblivion (2013), ~ Overview.